Medium vintage sewing button - paste with moonglow pink glass cabochons - delightful and dazzling! Small paperweight glass button - lavender with flowers - ball shape - pretty! Small antique glass buttons - glass overlay design with blue and red stripes- very pretty! Medium Red Oval antique glass buttons - glass overlay design with stripes- very pretty! 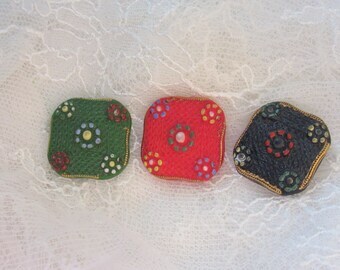 Lovely antique enamel sewing button - emaux peints with pierced design... scallop border - gorgeous!! Small Antique Waistcoat sewing button - Green foil design under glass - stunning! Small Antique Waistcoat sewing button - Purple foil design under glass - stunning! Set of small hand painted sewing buttons - abstract design - modernism - Montrian style... unique! Large antique / Victorian sewing Picture button - Swan bird - original tint - sweet & nice border too! Pair of vintage realistic rooster sewing buttons - made in Italy - amusing! Set of 4 Medium matching antique carved shell - mother of pearl sewing buttons - pinwheel design - nice! Cute as a "button" or should I say hat. Very prompt shipping. Well packaged. RESERVED ORDER Large realistic "straw" hat vintage sewing button - extruded spaghetti type - with fabric embellishment! Part of my vintage Flapper garter buttons and some painted bone buttons. Original Salesman Sample card with Lacy glass buttons - mother and daughter pairs. I bought the card of buttons at an antique shop many years ago & found the matching buckle elsewhere many years later!